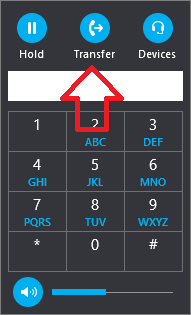 When you are in a call, click the Call Controls button in the call window. In the Transfer Call window, use the search bar to find the name or phone number of the person you want to transfer the call to, or select a name from your Contact list. Then click Transfer at the bottom of the Transfer Call window.